I hope you'll check out these blogs, and maybe even follow them. Some great reads for sure! Thanks for stopping by. I love these Friday posts. 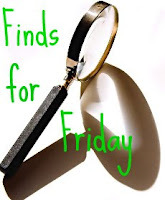 I have no clue how you keep up with everyone's blogs, but you pick some wonderful ones to list on Fridays. Thank you!